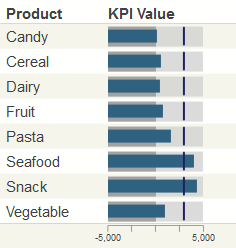 For a KPI or Ensemble business metric, you can use each property of that item as a column of the scorecard. 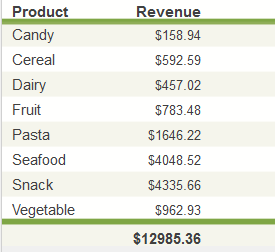 For a pivot table, you can use each column of that item as a column of the scorecard. In any case, you select the items to use as columns of the scorecard, and you specify the order of the columns. For information on creating pivot tables, see Using the DeepSee Analyzer. For information on creating KPIs , see the DeepSee Implementation Guide. For information on creating Ensemble business metrics, see Developing Ensemble Productions. Note that if you create a pivot table that displays only one measure, you must create that pivot table in a specific way if you want to display that pivot table in a scorecard. 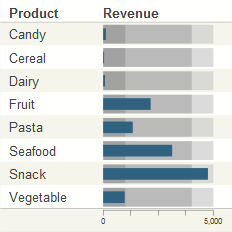 Specifically, drag and drop the measure to the Columns box in the Analyzer, rather than the Measures box. Anything One measure Nothing This pivot table can be displayed in a scorecard. Anything Nothing One measure This pivot table cannot be displayed in a scorecard. In this case, the measure is used as an MDX filter and cannot be configured as a property of the scorecard. Click either Regular or Big. See Kinds of Data Sources, earlier in this book. Optionally specify the basic settings, as described in Adding a Widget to a Dashboard, earlier in this book. Optionally enable or disable the Mini Analyzer. For this, access to the Widget Settings menu and use the Analyzer option. This option controls whether this widget displays the Mini Analyzer button. Add at least one scorecard column, as described in the next section. Optionally configure the widget further as described in the rest of this chapter. These options add a button to the toolbar. If you use these options, be sure the toolbar is visible (its display is controlled via the Toolbar option in Settings). See Reconfiguring a Widget, earlier in this book. A scorecard does not display any data until you add columns. A scorecard column is typically based on a property of the data source. In some cases, though, a scorecard column simply displays the item name or number and does not use a property of the data source. Click the plus sign + button. The system displays a dialog box where you specify the column. For Value, select a property of the data source, type a numeric constant, or type a formula. For information on formulas, see Specifying a Scorecard Formula, later in this chapter. Label  Type a label or optionally click the check box to the right of Label. If you click the check box, DeepSee uses the localized name of this property as the label; this option applies only when Value is a data source property. If you type a label, note that you can include \n to force a line break in the label. Hidden  Select this option to hide this value. 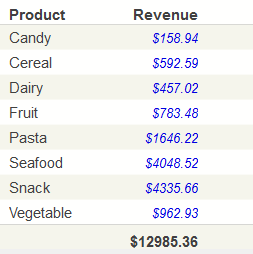 Value Column  Select this option to configure the value in this column as the value of the row. This value is passed to any custom actions; see Specifying the Value of a Row, later in this book. Select this option for only one data property of the widget. Format  Type a format string. See Specifying a Numeric Format String, later in this chapter. Configure the column as described in the rest of this chapter. For information on deleting and rearranging columns, see Managing Widget Properties, earlier in this book. The system displays a list of any columns defined for this scorecard. Select the column to configure. Specify options as described after this list. Hidden Not applicable; this property is not visible. Value  Specifies the value, if any, to display in this column. Select a property of the data source, type a numeric constant, or type a formula. You can omit this option if Display is Item Number or Label. Label  Specifies a header for this column. You can include \n to force a line break in this label. Cell Caption  Specifies an optional caption to place within each cell in this column. Header Align  Specifies how to align the column header for this column. Align  Specifies how to align the values in this column. Width  Specifies the width of this column. You can also modify the widths of the columns in the Size & Appearance menu of the Dashboard Editor. Value  Displays Value. This is the default setting. Conditional  Displays Value if the given property is defined. If the property is not defined, the column is not displayed. Sum  Displays the sum of the values given by Value. Target  Displays Target Value. % of Sum  Displays Value as a percentage of the total values given by Value. % of Target  Displays Value as a percentage of the Target Value for the same row. Sum  The summary value is the sum of the values in the column. 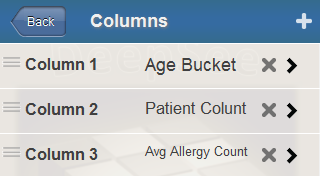 Avg  The summary value is the average of the values in the column. Max  The summary value is highest value in the column. Min  The summary value is the lowest value in the column. To refer to a column, use the name that you specified for the Label of the column. For information on creating formulas, see Specifying Formulas, earlier in this book. Format  Specifies how to display numeric values in this column. See Specifying a Numeric Format String, earlier in this book. Style  Controls the color and line style of the graphical objects, if any, in this column. See Specifying Line Styles, earlier in this book. Min Value and Max Value  Specify the minimum and maximum values to display if the column displays plot boxes, described later in this chapter. Min Value also affects arrows. Max Value also affects lamps. 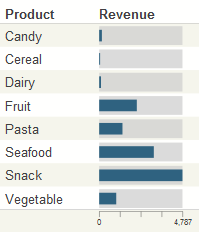 Target Value  Specifies the value to compare with the data values. Select a property of the data source, type a numeric constant, or type a formula (see Specifying a Formula, later in this chapter). You can omit this if Display is Item Number or Label. Lower and Upper  Control the appearance of plot boxes, described later in this chapter. Value Column  Select this if this column contains the value to pass to any custom actions. You must enclose the name in square brackets if it includes a space or any character that would be interpreted as an operator. String constants such as "my string"
The values 0 and "0" are treated as false, and all other numeric and string values are treated as true. IF(test-value,value-if-test-true,value-if-test-false) evaluates a value (test-value) and returns value-if-test-true if the logical value is true or returns value-if-test-false if the logical value is false. AND(value1,value2,value3, ... ) returns true if all the given values are true. OR(value1,value2,value3, ... ) returns true if at least one of the given values is true. CONCAT(value1,value2,value3, ... ) and returns the concatenation of the given values. For a column summary, in the Summary Value option. This option expresses the summary of a column in terms of the summaries for other columns. In this case, the formula cannot refer to scorecard properties; instead it can refer to scorecard columns, using their names given by the Label option. Display  Select Item Number. The column will contain item numbers. Label  Optionally specify the text to use as the column header. You can include \n to force a line break in this label. 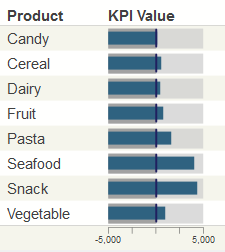 For a KPI, the column will contain the names of the rows, as shown on the KPI test page. Label  Optionally type the text to use as the title. You can include \n to force a line break in this label. Display  Click Value. This is the default setting. Value  Specify the value to display. Select a data source property, type a value, or type a formula. For information on formulas, see Specifying a Scorecard Formula, earlier in this chapter. Label  Specify the text to use as the column header. You can include \n to force a line break in this label. Target Value  Optionally specify a target value for use as comparison with the given data value. Select a data source property, type a value, or type a formula. Format  Optionally specify a format string. See Specifying a Numeric Format String, earlier in this book. You use Value Column only when you configure custom actions that require row values. See Specifying the Value of a Row, later in this book. Display  Click Trend Line or Trend Bar. Value  Specify the values to show in the trend line or trend bar. Select a data source property that contains a comma-separated list of values. 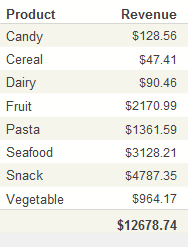 Or type a comma-separated list of values. Show As  Click Value. You can display trend lines and trend bars only for KPIs, because only KPIs can contain a column of comma-separated values. In an MDX-based KPI, you can use the %LIST function to build a comma-separated list. Display  Click Plot Box. Value  Specify the value to show in the plot box. Select a data source property, type a value, or type a formula. For information on formulas, see Specifying Formulas, earlier in this book. Min Value  Optionally specify the minimum value to display in the plot boxes. The default is zero. Max Value  Optionally specify the maximum value to display in the plot boxes. 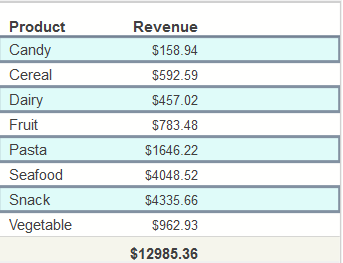 The default is the highest value displayed in the column. See the previous example. Lower  Optionally specify a value to divide the box into lower and middle bands. In the following example, Lower is 1000 and Upper is 4000. These options define three bands in the plot boxes: a lower band (below 1000), a middle band (between 1000 and 4000), and an upper band (above 4000). Upper  Optionally specify a value to divide the box into middle and upper bands. See the previous example. Target Value  Optionally specify a target value for use as comparison with the given data value; the default is 0. Select a data source property, type a value, or type a formula. To remove these vertical lines, set Target Value equal to a value that is out of range for the plot boxes. Also see the Base Value option for an alternative way to use a comparison value. 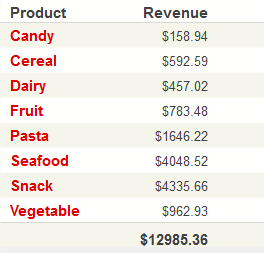 If the actual column value is less than the base value, the bar is displayed in a contrasting color (red by default). In all cases, the bar is drawn between the actual column value and the base value. This plot box includes vertical lines at the value 0. DeepSee draws these lines because Target Value is 0, the default. They use a data source property (or possibly a constant) as a source value. If the source value is negative, an arrow is displayed as a downward pointing triangle. If the source value equals zero, the arrow is not displayed. If the source value is positive, an arrow is displayed as a upward pointing triangle. If the source value is less than Min Value, an arrow is displayed as a downward pointing triangle. If the source value equals Min Value, the arrow is not displayed. If the source value is greater than Min Value, an arrow is displayed as a upward pointing triangle. Value  Specify the value to show in the arrow. Select a data source property, type a value, or type a formula. For information on formulas, see Specifying Formulas, earlier in this book. Min Value  Specify the value to control the direction of the arrow as described above. If the source value is negative, the lamp is displayed as a red circle. If the source value equals zero, the lamp is not displayed. If the source value is positive, the lamp is displayed as a green circle. The opacity of the circle is determined by the absolute value of the source value, divided by the absolute value of Max Value. 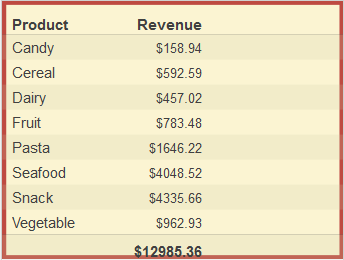 If Max Value is not specified, the lamp uses the largest value in the column. Display  Select Lamp or Lamp with Value. Value  Specify the value to show in the lamp. Select a data source property, type a value, or type a formula. For information on formulas, see Specifying Formulas, earlier in this book. Max Value  Specify the maximum value to control the opacity of the lamp, as described previously. DeepSee provides a rich set of options that you can use to customize the appearance of a scorecard widget. To access these options, access the Dashboard Editor, select the widget as described in Reconfiguring a Widget and then see the options in the Scorecard section. Scorecard > Size & Appearance  Provides options to control the scorecard overall. Scorecard > Titles  Provides options to control the text and formatting of titles in the scorecard. Scorecard > Colors & Style  Provides options to control colors and line styles in the scorecard. The easiest way to systematically alter the appearance of dashboards is to define and use themes, which are discussed in Defining and Using Themes. Themes use many of the options described in the following subsections. Size  Select the size of the scorecard, either Regular or Big. Show Title  Use this option to show or hide the scorecard title. Show Headers  Use this option to show or hide the scorecard headers. Show Footers Use this option to show or hide the scorecard footers. Row Height  Use this option to control the height of the scorecard rows. Arrow Size  Use this option to control the height of any arrows in the scorecard. You can override this setting and the following settings for any individual column in the scorecard. Lamp Size  Use this option to control the height of any lamps in the scorecard. TrendLine Hgt  Use this option to control the height of any trend lines in the scorecard. TrendBars Hgt  Use this option to control the height of any trend bars in the scorecard. This example also uses Plotbox Value, which controls the height of the value boxes (shown slightly shorter than the default). Plotbox Value  Use this option to control the height of the value boxes in any plot boxes in the scorecard. See the previous example. Column 1, Column 2, Column 3, and so on  Use these options to control the widths of the respective columns. You can also modify the column widths in the Scorecard > Columns menu of the Dashboard Editor. Title  Use this option to specify an optional title within the scorecard. Title Style Use this submenu to control the style of the scorecard title. Subtitle  Use this option to specify an optional subtitle within the scorecard. Subtitle Style Use this submenu to control the style of the scorecard subtitle. Title Align  Use this option to control the alignment of the title and subtitle. these titles can be left-aligned, centered, or right-aligned. Title Box  Use this submenu to add an optional box around the title and subtitle. Title Image  Use this option to add an optional image to the title. Charts have a similar set of options; for examples, see Titles and Labels, earlier in this book. For details on specifying this style, see Specifying Line Styles, earlier in this book. For details on specifying this style, see Specifying Chart Text Styles, earlier in this book. Lamp Negative  Use this option to specify the color of any lamps in the scorecard, for use with negative values. See the previous example. Plotbox > Mid Style  Use this submenu to control the style of the optional middle band of any plot boxes in the scorecard. The middle band indicates the values above the given Lower Threshold but below the given Upper Threshold. See the previous example. The position of the target line is controlled by the Target Value option.